Android 6.0 marshmallow after been released has been confirmed that there are a lot of hidden features we the users probably didn’t know or don’t know how to enable. The device preceded by the android 5.0 and succeeded by the newly Android 7.0 nougat was shipped in with hidden features Google developers didn’t want to enable. With main essential reasons withheld. Now the multi menu is one of the features we are going to look at today and learn how to enable. This feature was officially made available On the release of the android nougat 7.0 and mostly at times we refer to it as split screen. Must Read: How To Use Your Handwriting As a Font On Your Android Phone. In this article we are going to look out how to enable the multi menu features in your android 6.0 marshmallow device but firstly let’s see the functions of the multi menu/split screen features. What’s the function of the Multi menu in Android Phones? Multi menu/Split-screen was among the most requested features from seasoned Android users, and Google is finally adding it to the OS (officially shipped with android nougat). Here’s how it works, you put an app in split view mode by long pressing the recent apps button, which then also brings up the recent apps switcher at the bottom of the screen to allow you to select the second app you want in split view. You can also drag and drop contents between two apps in this mode thereby making multitasking even more convenient. By default, the split-screen mode gives both apps 50% of the usable screen area, but this can be changed to one’s liking by dragging the handlebar between the apps up or down. Even better, you can drag and drop text from one app to another in this mode, which can come in incredibly handy in some situations. In summary the multi menu allows you to run multiple apps at the same time. 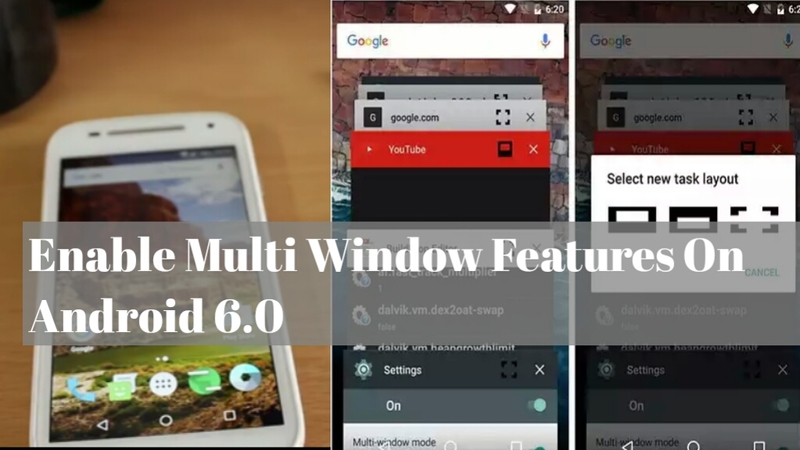 How to Enable Multi Menu in Android 6.0 marshmallow. 1. Download and install es file explorer file manger for android marshmallow device from here. 2. Launch the downloaded app and click on menu, scroll down a little and enable root explorer after enabling it grant it a root access. 3. Now from the es file explorer main menu click on sdcard and a drop down box will appear. Click on device and scroll down to locate the system folder. 4. Open the folder and scroll to the last line, you will see the system folder build.prop file. Open it using the es file editor. 5. 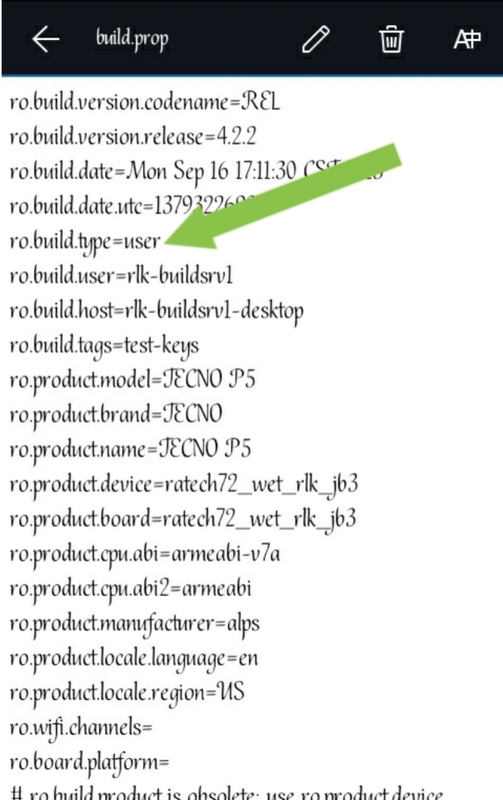 Scroll down and search for the text line ro.build.type=useruser Change it to ro.build.type=userdebug (adding the debug at the end of user) and save then reboot your phone to enable changes. 6. After your phone has rebooted Goto settings>About phone>build number (tap it 7 times enabling you to become a developer). Now go back and click on developer option, scroll down and enable multi window mode. 7. After that hold the minimizing button and you will notice a square box beside every minimized app. 8. To split app select any of the recent open app and a box will appear, on select new task layout just make your choice and viola you will see it the multi window feature working on your android 6.0 marshmallow device. 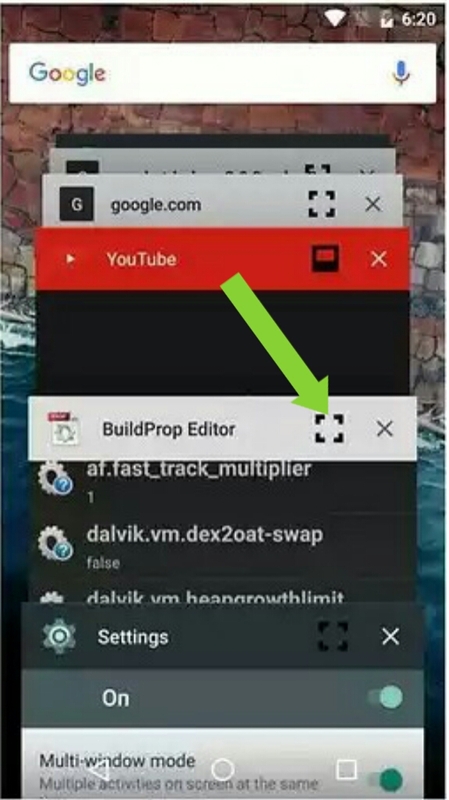 With build prop editor, you can easily enable the multi window mode on your Android 6.0 marshmallow. The build.prop file is a system file that exists on every Android device. The file contains build information and other system properties which are used throughout the operating system. 1. Download and Install the build.prop apk for Android from here. 2. Launch the app after installation and grant it root access. 3. Now scroll down a little and locate the file text ro.build.type=user.Rename it to ro.build.type=userdebug as said earlier. 4. Save and reboot device to enable changes. 5. After your phone has rebooted goto Settings>About phone>Build number (Tap it 7 times to become a developer). 6. Go back to settings>Developer option and enable the multi window mode. Note: If your device is not rooted, you can try the above steps without editing build.prop just Goto settings>About phone and tap build number 7 times as said earlier. Now go back and click on developer option, scroll down and look for Enable multi window mode, tap to enable and minimize your phone to see it working. Hope you liked our little tinkering and hopefully it will work on your android 6.0 marshmallow device. Drop a comment below regarding any problem!..